Looking for a rare bird among the world of Saabs? You don’t even need to look as far back as the 1970s 99 – you can find it right up through the late 1980s in a series 1 9000. Even on enthusiast sites like Saabnet, it’s hard to find many first-gen 9000s listed there. And those that are available for sale are either miserable $500 projects or high-mileage drivers. Alfa 164s, surely the less successful platform-mate in America, seem to survive in greater numbers than these. So it’s surprising to find a nice, cared-for example of the model, with turbo and manual transmission. 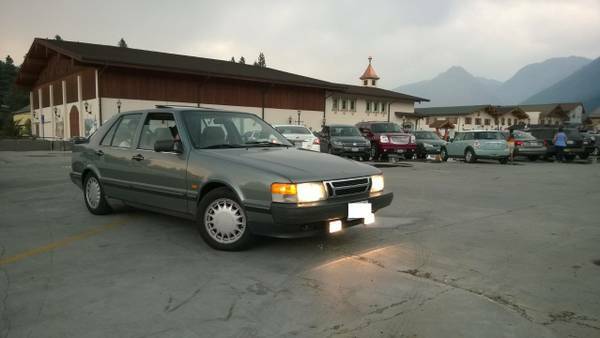 Check out this 1989 Saab 9000 turbo for sale for $3000 in Seattle, WA. The car is likely to have minor scrapes and bumps – all cars from the current plastic-bumper era seem to have them – but overall looks really clean and straight. The grey paintwork still seems to hold a shine, though some of the plastic trim bits seem to be a bit oxidized. 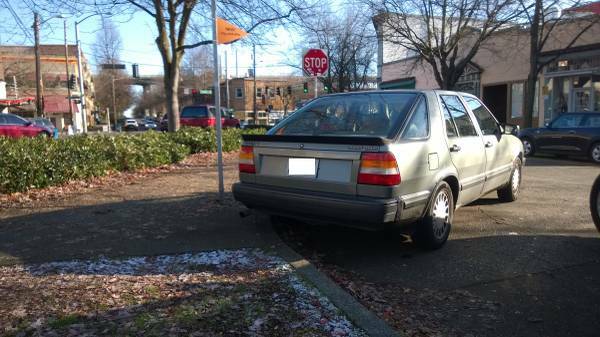 The seller certainly seems to be a fan of the 9000, praising its mid-range acceleration and freeway cruising abilities. He does also concede that there is some minor rust where trim pieces took the paint off. 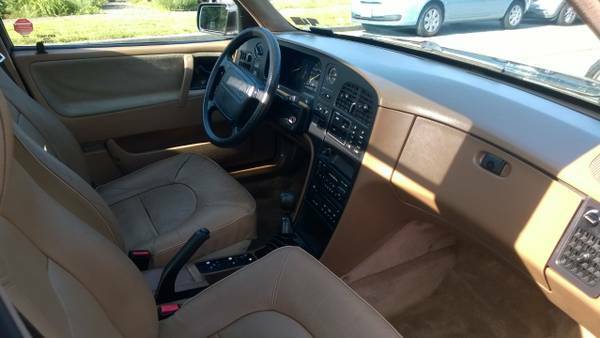 The interior is surprisingly good for the age of the car – most 1990s Saab seats either have split, collapsed, or otherwise lost their shape. This one is said to have Elmo leather in good shape (oh the humanity – don’t tell Grover and Big Bird), and the seams on the driver’s seat were recently restitched. The HVAC is said to be fully functional, and the car has its factory CD player, while the heated seats have delayed activation (is that a feature or a defect?). This Saab is said to benefit from many newer parts, including tires, battery, lower motor mounts, high-pressure A/C hose, and front struts. However, the auxiliary pulley is said to be showing its age and needs replacement soon. Unfortunately, Saab was too far ahead of the game. Having kicked the bucket, the entry-luxury 5-door hatch segment is being covered by BMW’s 5-series and 3-series GT, and they’re acting all creative like they just invented this body style. All in all, these are great road trip cars, with comfort and room for four, and they’ll capably cover U-Haul duties in a pinch. You’d have a sports sedan and yet never miss having a pick-up truck – where can you get that nowadays? Oh, right. This entry was posted on December 31, 2014 at 12:16 am and is filed under Feature. You can follow any responses to this entry through the RSS 2.0 feed. You can leave a response, or trackback from your own site.